Gateway has thrown down the gauntlet in the budget-plasma arena. Plasma panel prices continue to drop precipitously as the technology gets hotter and hotter. Gateway, provider of digital-technology solutions, has entered the home theater market with the GTW-P42M102 42-inch plasma panel, which has a native resolution of 852 by 480 in progressive-scan mode. It's a perfect example of plasma's ongoing price reduction. The streamlined display is 25.2 inches high, 40.8 inches wide, and a very slim 3.7 inches deep, and it weighs less than 70 pounds. The handsomely designed set sports a silver finish with a small, dark border surrounding the screen. The GTW-P42M102's performance characteristics are a mixed bag; however, at a list price of $2,999, there's no denying that it's the best value by a country mile in the 42-inch-plasma-panel category. The GTW-P42M102's connectivity suite is quite generous. Two wide-bandwidth component video inputs with stereo audio allow you to hook up both a progressive-scan DVD player and an HDTV set-top box, which isn't the case with all plasma panels. There's one S-video input and one composite video input with accompanying audio ins. 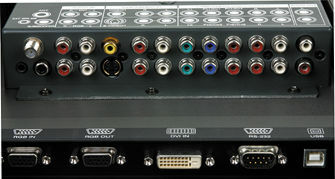 You also get a 15-pin VGA-style RGB input for use with either an HDTV set-top box or a computer and a DVI input for computer use only, each with its own stereo audio input. There's also a 15-pin RGB output for routing the video to another display, an RS-232 port for use with a touchscreen remote system, one RF input, one set of selectable (fixed/variable) audio outputs, and a subwoofer output for enhancing the onboard audio. The most important picture-enhancing feature is the video processor's 3:2 pulldown, which is designed to prevent artifacts in images from film-based material. To tweak the overall color palette, you get a choice of four selectable color temperatures—low, 6500D, mid, and high—which run from a warm reddish cast to a very cool bluish cast. The set also sports a 3-D comb filter for composite video sources like VHS and cable TV. The remote is large and a bit awkward to handle, but it's well laid-out and fairly intuitive to use, as is the onscreen menu system. In terms of convenience features, the GTW-P42M102 has dual-tuner picture-in-picture (with selectable window-position settings) and picture-on-picture, which allows you to watch more than one program at a time or keep tabs on two sporting events simultaneously. In addition to the subwoofer output, the Gateway has a 5-watt-per-channel onboard amplifier that drives the left and right speakers. These are uncommon features for a plasma, as most plasma displays are just monitors with no tuners, and only a few plasmas on the market have onboard audio systems and speakers. Thanks to the fact that it has no fans, the GTW-P42M102 features whisper-quiet operation. Audiophiles will no doubt appreciate this feature, as fans can often disrupt the home theater audio experience. Plasmas generally run quite hot, and I don't know of another plasma that doesn't have multiple fans for cooling. Expectedly, the GTW-P42M102's out-of-the-box performance at the factory settings was pretty dismal. The set comes from the factory with its contrast set to 100 percent and its brightness set at 50 percent, which initially produced a very washed-out picture with no detail to speak of at or near black. A full calibration for both NTSC sources and HDTV material toned down the overdriven picture and made the set much more enjoyable to watch. Using my Sencore Color Pro 5000 spectral-based colorimeter, which was designed specifically for fixed-pixel displays such as plasma, DLP, and LCD, I found that the gray scale in the 6500D color-temperature setting was fairly close on the bottom of the gray scale, measuring 6,200 Kelvin at 20 IRE. It was also quite blue at the very top, measuring 10,200 K at 100 IRE, with a blinding peak light output of 63.5 foot-lamberts. The GTW-P42M102 does give you all of the parameters you need to correct the gray scale, and my review sample calibrated quite well. After calibration, it measured 7,000 K at 20 IRE. From 30 IRE, the panel tracked within about 100 K of D6500 K right up to and including 100 IRE, which measured a near-perfect 6,525 K with a peak light output of 26 ft-L. This is excellent gray-scale performance for a plasma TV. When I set the black level on a low average picture level (APL) PLUGE pattern, the GTW-P42M102 had a raised black level on a high-APL PLUGE pattern, which indicates that the black level floats a little bit. This panel's black-level performance is its weakest point in terms of picture quality. While all plasmas suffer from poor black-level performance to a degree, the Gateway is worse than most plasmas, producing very washed-out blacks that are really a dark gray. Consequently, detail at or near black is nearly indiscernible. False-contouring artifacting—also known as solarization—was also clearly visible in dark scenes. In all fairness to Gateway, this is another problem that's associated with plasma technology in general, and the GTW-P42M102 is no worse than most of its competition in this regard. The panel's color decoder is quite good. I found no evidence of red push; and, after I set the color and tint with SMPTE color bars and a blue filter, I didn't have to desaturate the color at all. When I checked the green with a green filter, I saw what I can only call a green push. This was clearly visible on the Monsters, Inc. DVD. In chapter 4, Mike (the little green monster with one eyeball) looked limey or almost neon when compared with my reference, the Runco DTV-991 projector. This is a common problem with fixed-pixel displays like plasmas and DLP projectors; it's a result of the primary color of green used (see the measurements box). To check the GTW-P42M102's scaler for 3:2 pulldown, I played the opening scene of Star Trek: Insurrection. I was pleased to see that Gateway has indeed included this important feature, which eliminates motion artifacts. The GTW-P42M102 pristinely reproduced this scene's bridge railing, canoes, and rooftops. After calibration, bright scenes on both DVD and HDTV material looked quite good. Chapters 4 and 5 of Monsters, Inc. had excellent color saturation, and the picture had snap and lots of detail. Chapter 4 of Hollow Man also looked quite good, with natural-looking skintone rendition and deeply saturated color. Dark material was much more problematic. In chapter 2 of Hollow Man, which starts with a very low-lit bedroom scene, the GTW-P42M102's poor black-level performance obscured much of the detail. I performed separate calibrations for black level, color, and tint for 1080i with my HDTV signal generator, and then I sat back and watched a wide variety of material off of my Dish Network HD feed. Again, bright scenes from the Dish Network demo channel and movies from HBO and Showtime looked really good, with great detail and excellent color saturation. Conversely, as I watched Romancing the Stone on HBOHD, the picture still looked somewhat washed-out in dark scenes, and false-contouring artifacts were clearly visible. Again, black level is plasma's weakest point in terms of picture performance. Still, the Gateway suffers in this area more than most of the plasma panels I've tested in recent months. This problem is usually due in part to the video-processing bit rate. Systems that use 10-bit video processing, like Runco's plasma panels, have a somewhat better black level than 8-bit designs. I suspect that the Gateway uses 8-bit video processing, and this may be the reason that its black level is as bad as it is. However, like so many picture-enhancing improvements in the high-end home theater arena, higher-bit-rate processing costs money, and Gateway is obviously aiming at a very aggressive price point for the lower end of the plasma market. Gateway's entrance into the home theater market with the GTW-P42M102 42-inch plasma is only the beginning. According to the company, more models will be coming in the future. 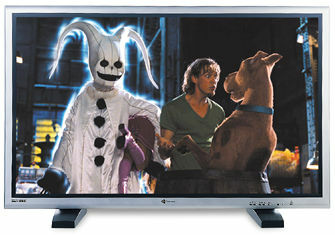 Currently, Gateway sells this plasma alone for $2,999; with a Bose 3-2-1 home entertainment system ($999 value) and basic delivery for $3,999; and with the Bose Lifestyle 35 home entertainment system ($2,999 value) and basic delivery for $5,999. At $2,999, the Gateway GTW-P42M102 is roughly half the price of the cheapest of the 42-inch panels currently on the market, which makes it the best value in its category, bar none.